An open house flyer is a printed announcement that gives prospective buyers complete information about a home and the date/time of the open house that showcases that home. Used by agents who want to target early and mid-stage buyers, open house flyers can be created using templates that are customized easily. Many agents don’t have much time to design and print eye-catching open house flyers. Fortunately, ProspectsPLUS! 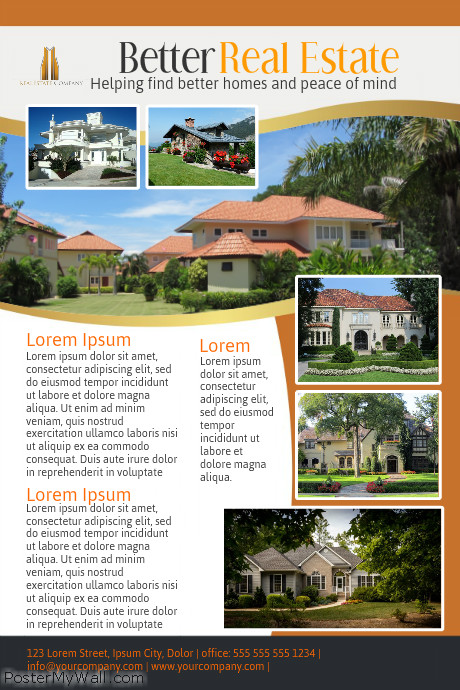 saves time by offering free real estate flyer templates and an easy-to-use online editing platform. 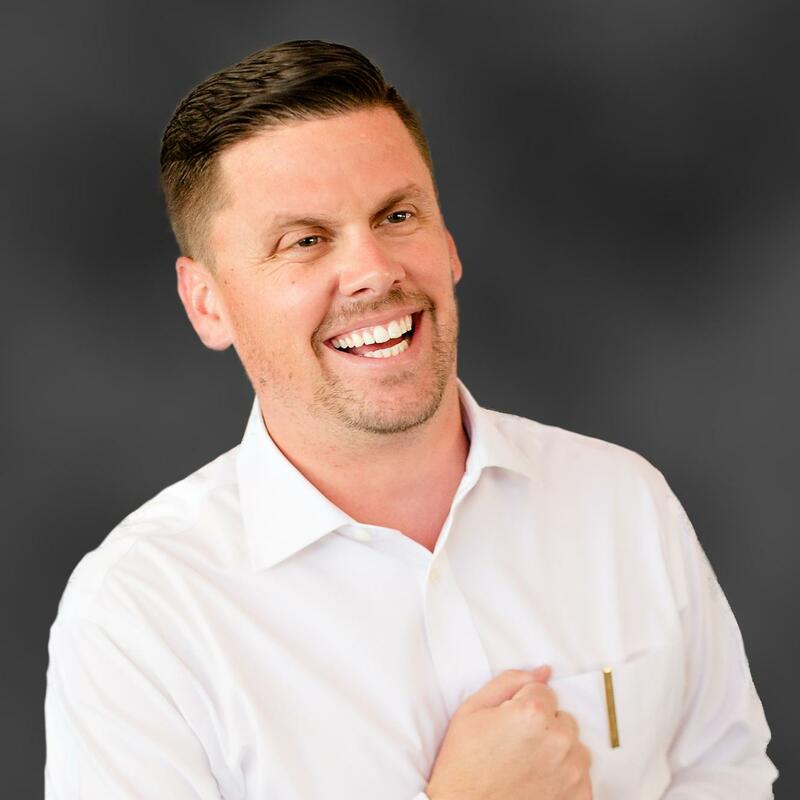 Click below to find out more about ProspectsPLUS! and start designing your open house flyer in minutes. 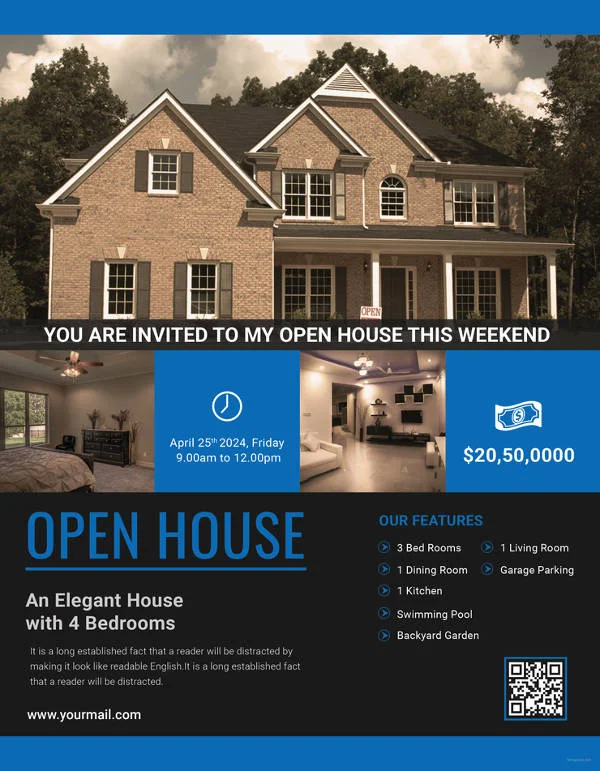 Here are 15 of the best free open house flyer templates. 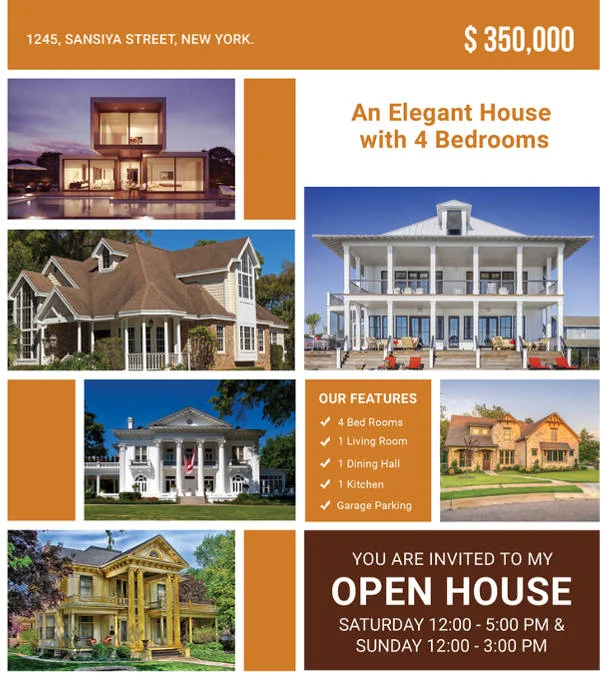 Why it works: The large image mixed with three smaller images gives visual interest to the open house flyer. The large image can be used to show off a stunning view or a feature of the home. 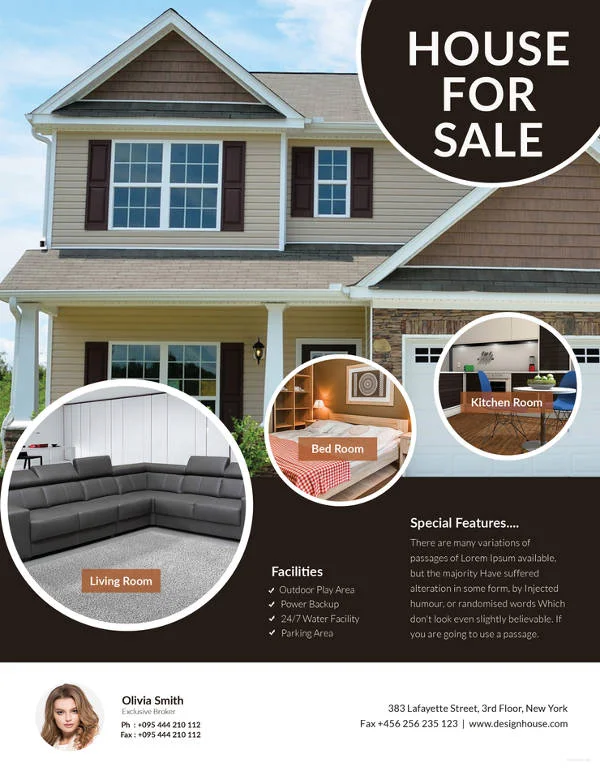 With room for a description and details about the property, this open house flyer template still leaves enough space for the agent details and branding. Why it works: This open house real estate flyer emphasizes the features of a home with great photography. It uses visual appeal to sell the home and balances the photos with minimal text, including a short list of features, a description, and real estate agent contact information. Why it works: This free real estate flyer template uses one large image as a focal point while adding three smaller images in decreasing size to showcase features. 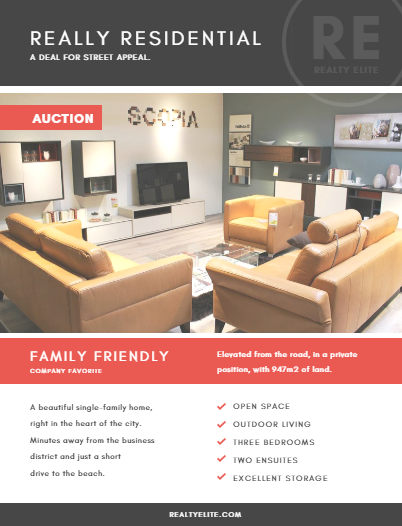 The template includes space for a text feature list and a descriptive paragraph while contact details are presented at the bottom on white space to draw attention to the real estate agent. Why it works: This open house flyer is designed for buyers who want the minimum amount of details in print but will visit the website readily or scan for more information. This quick response (QR) code open house flyer template with limited colors and grid design would be a great way to get buyers to view a 3D tour or video about the property. Many agents don’t have much time to design and print eye-catching open house flyers. Lucky for you, you can take all of them home with you now! 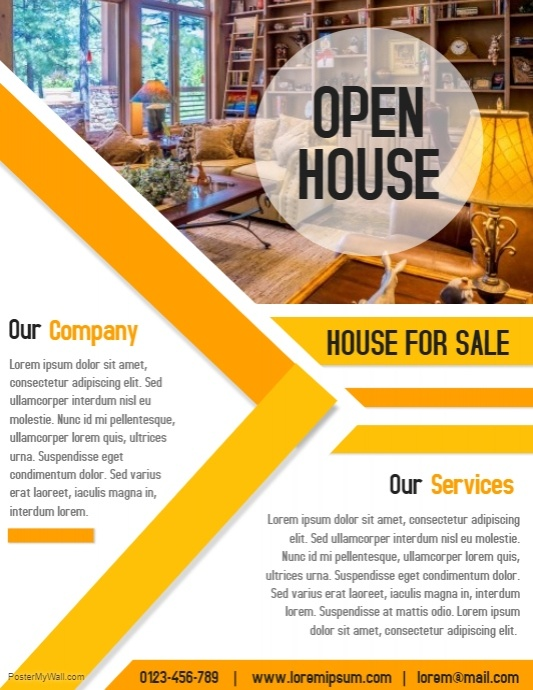 Why it works: This open house flyer template is for the visually oriented buyer who will visit the website to find out more details. 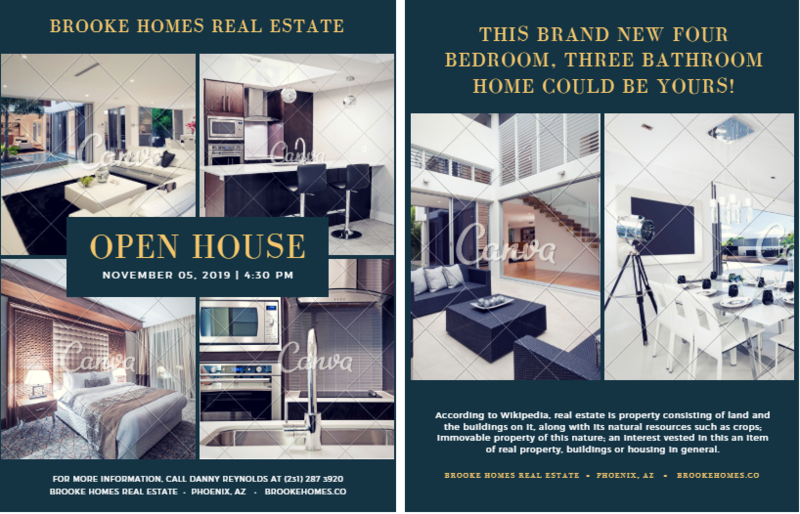 With a strong footer for real estate agent contact details, the lack of text information gives the images control of this open house flyer. Why it works: Inviting visitors to view two properties is the focus of this open house flyer. 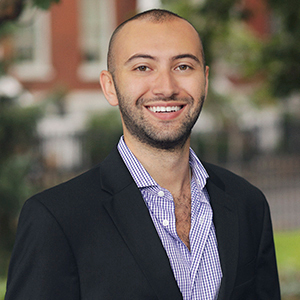 Agents displaying two properties in the same area or with the same search details can benefit because buyers can visit more than one open house in a day. The large photos with room for details provide enticing details for the buyer seeking open houses. Why it works: This free real estate flyer template gives the agent the ability to present several images mixed with small blocks of text to give the buyer cues about important details. With the location and price at the top, the buyer can get details about the house without large blocks of text. Why it works: The ability to add text about several properties, the company, and the agent make this open house flyer flexible. The large images give an overall impression of the type of properties the company represents, and the text boxes with headers help to hone the message. Why it works: This well-balanced open house flyer template gives buyers an overview of important details like features and pricing with a selection of inviting images. 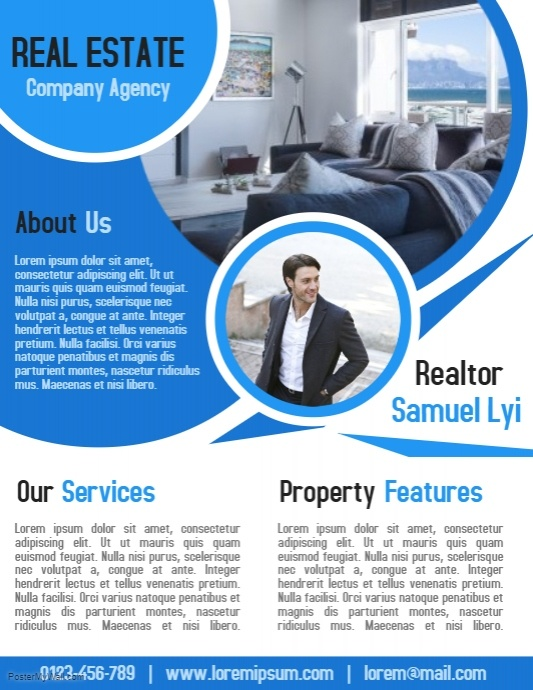 This template combines a large space for a description with bolded text that calls out selling points and prominent real estate agent contact information. Why it works: This open house flyer is focused on the brand of the brokerage and promoting its services. 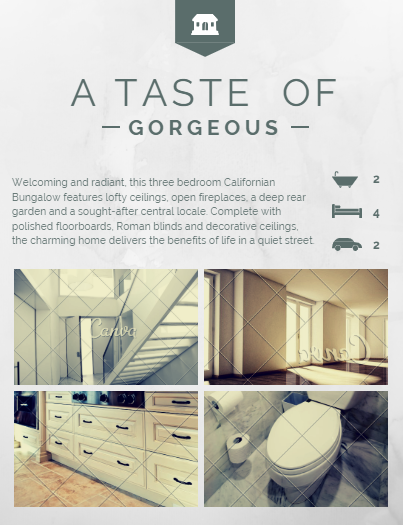 To ensure the design of this free real estate flyer template is consistent no matter what images are included, the flow of color and style are created to ensure any brand is well represented. Why it works: With an open house flyer template that showcases a real estate agent, this open house flyer design highlights the agent instead of the home, building trust early on in the buyer relationship. 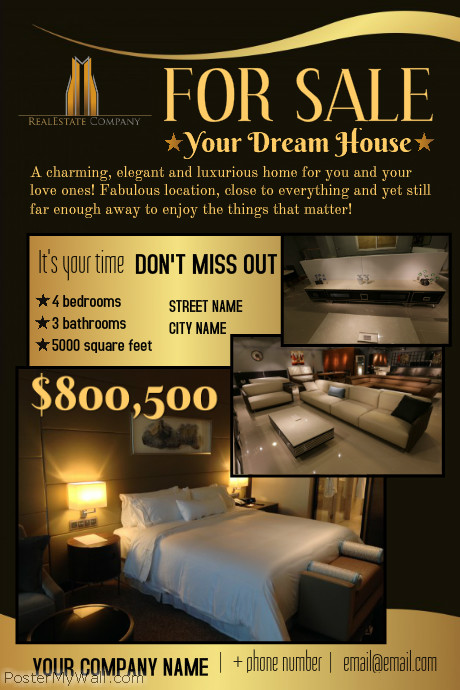 Ideal for a condo or unit sale, the overall property features have a prominent place in the open house flyer. Why it works: The dark background, fonts, and gold trim work to give this open house flyer template a high-end feel. Conveying the “dream home” vibe, the contact details, features, and pricing are front and center for the buyer. Why it works: This free real estate flyer does double duty with two sides to display images, features, and descriptive text. 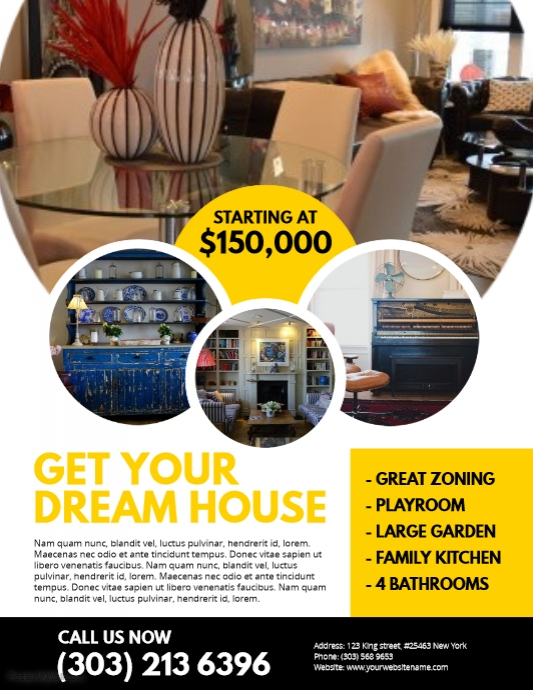 With bold headlines to draw attention to the CTA and pricing, this open house flyer is well-designed with a good balance of images and text. Real estate agent contact details are not included on this free open house flyer template. Why it works: This open house flyer is both simplistic and detailed. 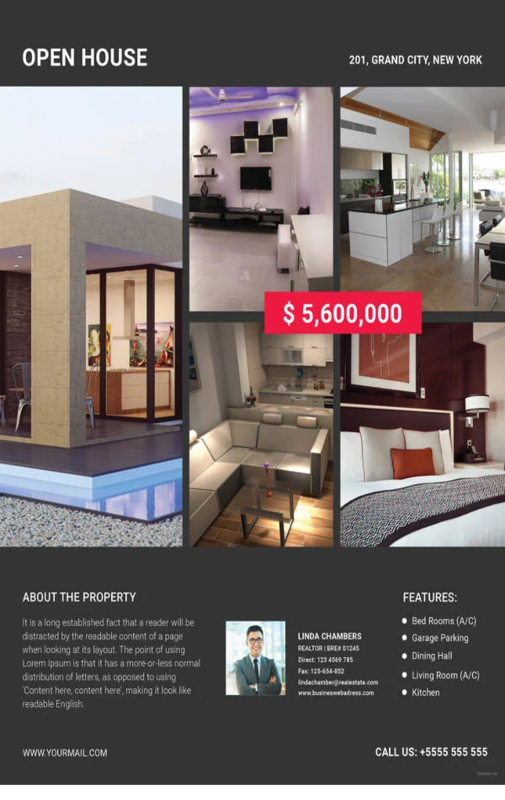 With a great hero image to draw attention and checklist of features, this template is easy to browse with a quick overview of property features. Why it works: This single property open house flyer highlights the specific features of a home with images and icons for bathrooms, bedrooms, and garage specifications. The design allows for a short descriptive paragraph with images to tell the full story. 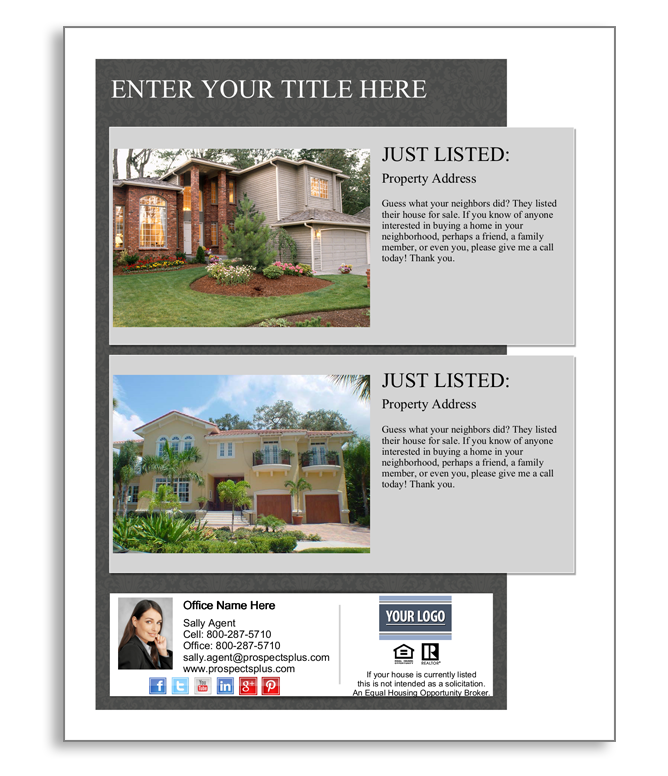 Open house flyer templates are designed to allow agents to easily fill in fields or boxes with their information and images to make brand or property-specific. There are some things that you should include in your open house flyer to increase conversion and engagement, however. Some of these include home features/amenities, time of open house, property images, asking price, and real estate agent contact information. Distributing your open house flyers can be tricky, even with online efforts, because there is so much information floating around in any neighborhood. You can distribute your open house flyer online, through email, by mail, text, or in person. 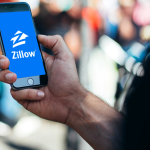 Send emails and texts: By sharing your open house flyer through email or the details of your event through texting services, you can reach out to an interested audience on their smartphone. A successful open house flyer reaches buyers with the right mixture of information and images to increase interest in a property. Getting potential buyers to the open house using a free real estate flyer template can mean an increase in sales opportunities. Here are some tips from the pros about ways to escalate interest using open house flyers. When creating a flyer, there should be a ton of information besides the home listed, so the buyer has everything needed. A potential buyer is going to have many questions regarding the area, so it is important to list as much info as possible. A sheet of paper front and back can only hold so much information. However, creating a virtual tour sheet can give a potential buyer all the information needed. It’s good to put your image and personality on a flyer. There are apps like Canva that give you that ability to design to incorporate your logo with excellent high-resolution images to get your message across. It all depends on your audience you want to appeal to. The very best tip I have for open house flyers is having a clear CTA for the flyer receiver. Many open house flyers say “Open House,” and if you leave this flyer, most people will toss it without a care. If you give them a CTA like “Choose your new Neighbor,” I find that does far better at converting them. For an open house flyer, your audience is searching for a way to see how the prospective house will look like before they decide to visit. Have crisp and clear images of your house but don’t clutter the flyer with too many of them. Don’t forget to put in all your contact information such as telephone, address, and email. In the Tampa Bay market where we work, 20% of our buyers are from other countries. We always put measurements in metric equivalents as well as the units of measure we’re all used to. We’re also careful not to use any acronyms or industry slang terms or any slang for that matter. 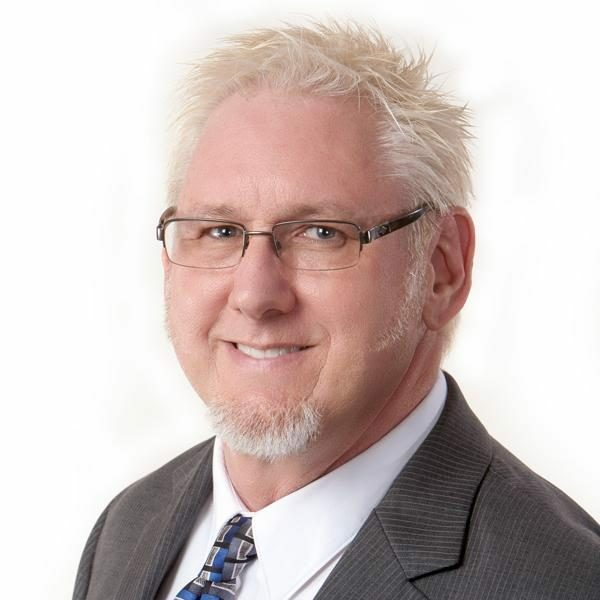 It’s all about quick, clear communication and making it easy for the prospective buyer. The right resources and tools for editing your open house flyers are important for saving time and money. If you are spending hours creating open house flyers, then these tools can help you create a professional-quality design with minimal effort. A quality open house flyer template gives real estate agents the ability to add information and images quickly without heavy design programs. 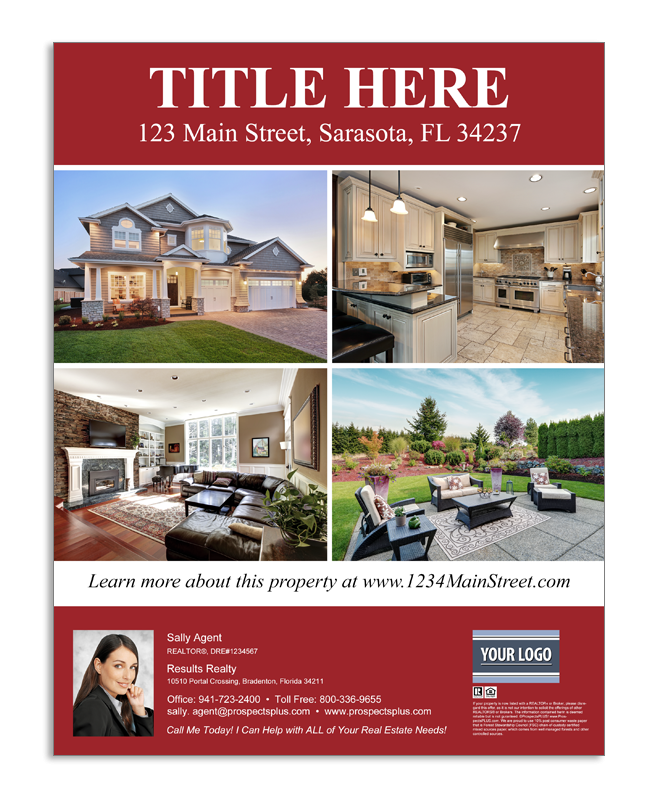 Free real estate flyer templates allow agents to share details like location and features about their open house with potential buyers. The goal of an open house flyer should be to attract buyers and invite them to the property, ultimately resulting in a sale. To take the hassle out of flyer printing, ProspectsPLUS! offers real estate agents in-platform design and printing solutions. Plus, ProspectsPLUS! 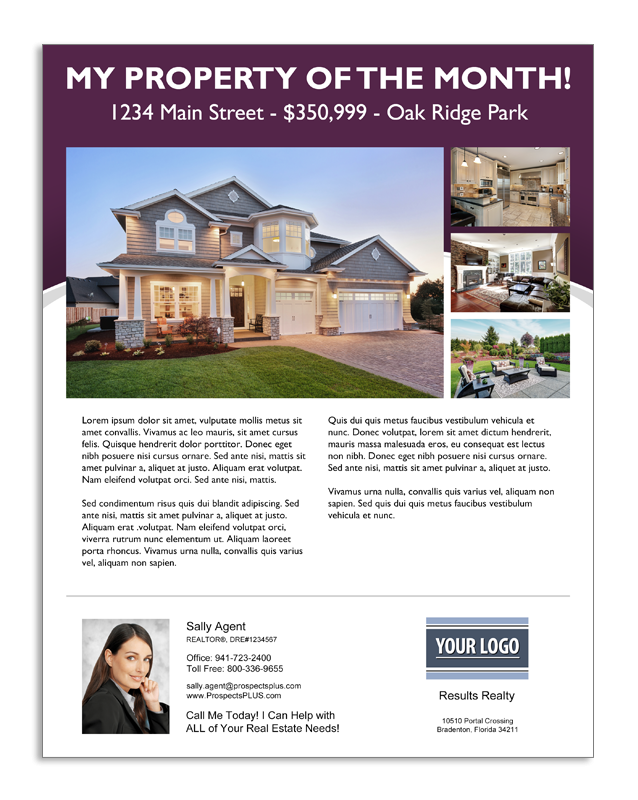 gives agents free open house flyer templates to pick from and makes it easy to drag and drop or click to add text and images. 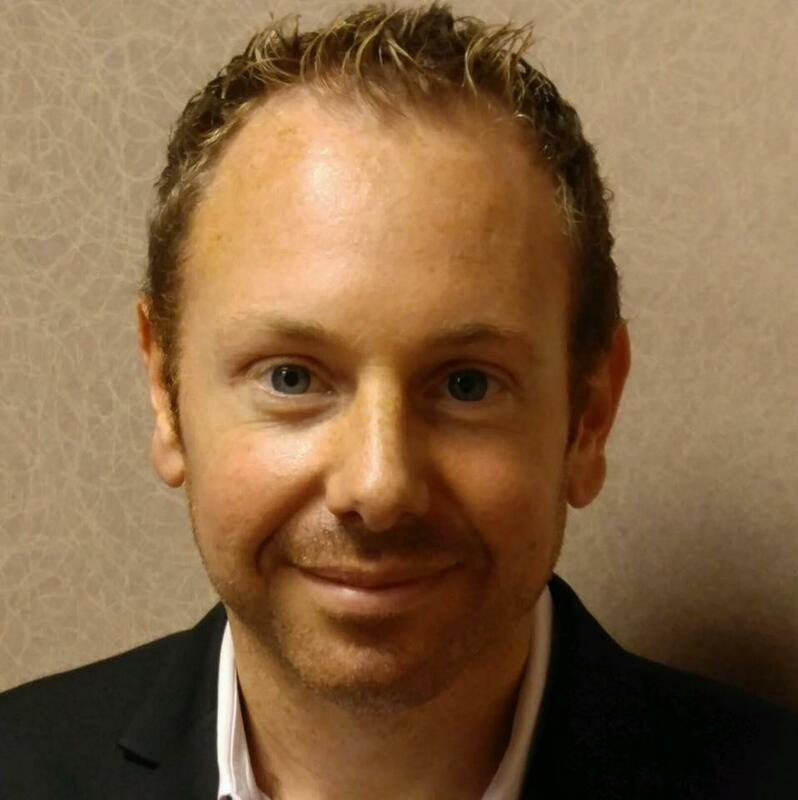 Find out more about ProspectsPLUS! by clicking below. Great collection of templates, thank you! Hey D’Ambrah, glad you liked the template. Best of luck with your open house.